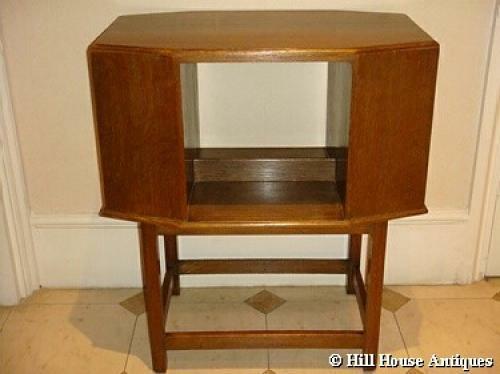 An early 20thC oak (very slightly limed) elongated octagonal booktable on octagonally facetted legs, c1920s; possibly by Heals. Open recesses for books on all four sides, with a central short upstand divider in open middle section. Approx 27.5" high, 24" wide and 14.5" depth. Height of each recess approx 11.5". Depth of each end recess approx 6.25" and depth of each central recess approx 7.25" either side.